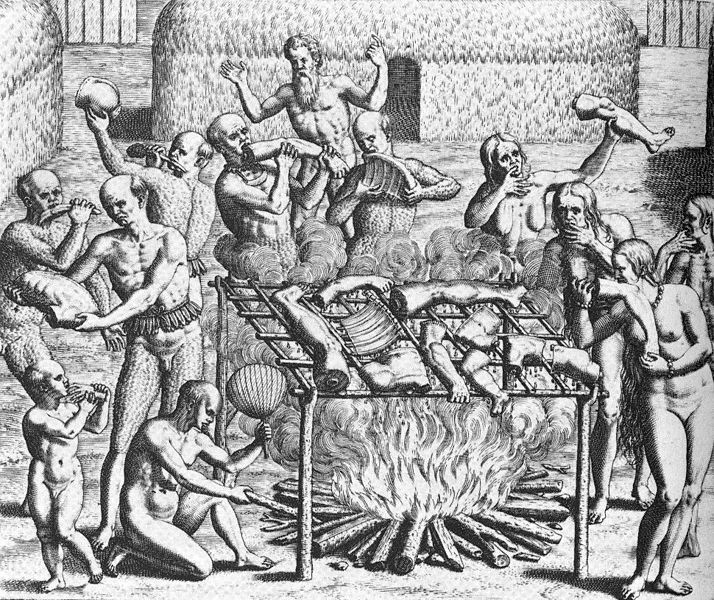 Say the word ‘cannibal’ and most people in the west have been brought up to think of some tribe of man eating savages located in the deepest jungle, maybe in a place like Borneo. But in a recent book on the Second World War by Max Hastings – called Inferno (nothing to do with Dan Brown) – he alleges that the people of Leningrad in Russia were so hungry during the Nazi onslaught that they ate their own. The Imperial Japanese Army has also been accused of cannibalism of prisoners in the same war – again in recent books on the subject. So what about our favorite time period – the Middle Ages? I was asked by a regular visitor to this blog whether allegations of crusaders indulging in cannibalism were really true. Well, the chronicles suggest it happened – even if we have to treat all written accounts with a pinch of salt. But we should give some credence to the stories because those writing about crusaders eating their Saracen enemies weren’t Muslims – they were Christians. Astonishingly, one person accused of cannibalism is none other than Richard the Lionheart. It’s said that he requested pork to eat while camped outside the Hospitaller fortress of Acre in modern Israel. His attendants cook him up some Saracens on the basis that they taste of pork (even though they’re not allowed to eat pork – go figure!). Richard bolts down his food and asks to see the pig’s head. Needless to say the attendants produce a Saracen’s head and Richard, far from being appalled, gets stuck into some more “pork” pointing out to his men that they shall never starve as this meat is so plentiful. This story might have been intended as a sick joke or a boastful means of scaring the Saracens – conversely, the incident may have happened. You have to recall that Richard the Lionheart presided at a mass execution of prisoners so there was a very mean streak to the man. In an earlier incident in 1098 during the First Crusade – a year before Jerusalem was taken by Prince Tancred – the crusaders overran a Syrian town called Ma’arra. Christian chroniclers, three of them, felt constrained to both record and try to excuse acts of cannibalism by the crusader. In his History of the Expedition to Jerusalem Fulcher of Chartres wrote the following about what happened at Ma’arra. One day [Richard the Lionhearted] told his cook to have some fresh pork for dinner…but the cook had no pork. He was in trouble, for if there was no pork on the table he would stand a chance of having his head chopped off. He had heard it said, however, that human flesh tasted like pork. …he killed a Sacracen prisoner and cooked some of the flesh and had it placed on the table. …With much trembling he brought the head of the Saracen. The king laughed when he saw it. “We shall not want for pork as long as we have sixty-thousand prisoners,” he said, not in the least bit disturbed to know that he had been eating human flesh. The Saracen general, Saladin, sent thirty ambassadors to Richard beseeching him not to put the prisoners to death. Richard gave them an entertainment, and instead of ornamenting the banquet with flowers, he had thirty Saracens killed, and their heads placed on the table. Instead of acceding to the request of Saladin, he had sixty-thousand men, women, and children slaughtered out on the plain east of the city of Acre. -Taken from the history book, “The Story of Liberty” by Charles C. Coffin. Written in 1879. Based my my research of this book, so far everything has been extremely reliable and true to the facts. When I hear of the word cannibal, I think of a fancy Docter named Hann ibal who is gay for a crazy brunette and some ginger lady. Ah well, there have been plenty of other cannibals aside from Hannibal. Eating human flesh in famines is a big taboo subject but one recent book suggests cannibalism happened as late as the Second World War with the residents of Leningrad eating human flesh while holding out against the Nazis and the Japanese allegedly eating the flesh of prisoners of war. The slicing off of buttocks of heavy women in medieval Fustat, Egypt, during famine was also practiced. I hadn’t heard that before!